The Minnesota Vikings open training camp today in Mankato, kicking off the franchise’s 50th season of existence. Even as the National Football League continues to grow and refine its product, training camp remains the most savory fan experience, and that’s not by accident. 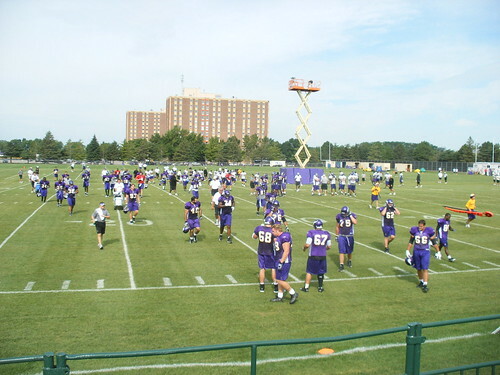 I worked as an assistant to the Minnesota Vikings sales and marketing team during the 2007 training camp. (That had less to do with my qualifications and more to do with knowing the right people from Mankato and my alma mater, Minnesota State University.) Nevertheless, I was able to finagle my way into a 100-hour-per-week job, acting as a small, temporary cog for the well-oiled Vikings machine. Adrian Peterson’s first day. I remember AP strolling into the cafeteria for his first day of training camp, a playbook tucked under his arm as he shook hands with fellow players and coaches. He arrived a day late because of contract negotiations, but he arrived with a glow, as if he was a gift sent from the football gods above. He just looked – special. Getting stuck between Pat Williams and Bryant McKinnie in the lunchline. I was forced to choose between lobster and prime rib. Ultimately, I squirted out of line and chose life. Getting stiffed for $500 by Chad Greenway. Well, sort of. Greenway had spoken at a VIP event on behalf of Miller Lite. For his 15 minutes of hard work, he was to receive $1,000. When I delivered the check, Greenway was busy taking off his pads and cleats. “If you open it for me, I’ll give you $500,” he said. I went flush. (Mind you, I was still a broke college student.) I opened the envelope, but Greenway never paid. As a fellow South Dakotan, I quickly forgave him. The I-35W bridge collapse. I was sitting in the dorm lobby beside several players watching Barry Bonds go for the career home run record. News of the 35W bridge collapse broke, and almost immediately, every player sitting and passing by was on his cell phone, glued to the TV. That really changed the mood of camp. Working with workaholics. It wasn’t long before I realized I could never work in professional sports. The players catch flak for their exorbitant contracts– and rightfully so– but the people behind the scenes often work 360 days per year, and rarely get a day to themselves from the start of preseason up to the Super Bowl. Training camp used to be about sequestering a team in a nondescript college town, cooping them up in dormitories and building unity through adversity. Nowadays, wherever players go, distraction follows. The Vikings could just as easily keep camp at Winter Park in Eden Prairie and never once open to the public. Training camp provides little in the way of revenue and some might argue it’s not worth the trouble. But, here’s the secret: It’s all about the fans. This marks the Vikings’ 45th consecutive training camp in Mankato, and while other cities may offer better financial incentives, the franchise believes Mankato is the perfect meeting place for fans. Make some memories of your own. If you’ve never been, take a day and bring family if you’ve got it. Training camp remains one of the few unblemished sporting experiences where the fan comes first. Invasion of the "do bikes"
Will Facebook Questions help keep the lights on?